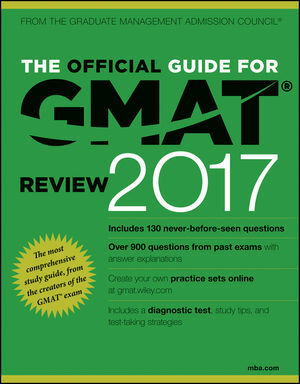 The Official Guide for GMAT Review 2017 is the ultimate preparation kit from the makers of the GMAT exam. You'll find success strategies and test-taking tips from the experts at The Graduate Management Admission Council, along with in-depth grammar and math reviewbut you'll also find so much more. This book is designed to provide you with a targeted preparation experience customized to your strengths and weaknesses. A diagnostic test helps you prioritize your study time, while the companion website (gmat.wiley.com) allows you to create your own practice tests focused on the areas you need to improve. Over 900 past exam questions are answered with explanations, and actual example essays are included with scoring information to help you plan your approach in advance. This new 2017 edition contains never-before-seen material, including 61 quantitative, 61 verbal, and 8 integrated reasoning questions with full explanations to enhance your level of preparation. The GMAT's scope and importance make it a high-pressure exam. Don't waste valuable time going over what you already know. This book helps you discover what you don't know, and tailor your review to turn weaknesses into strengths. Confidence is key, but actual knowledge is what drives a high score. Thorough preparation is the most valuable advantage you can have on the GMAT, and The Official Guide for GMAT Review 2017 delivers a personalized review plan tailored to you.